Simon has illustrated many books including Norah the Snorer, Foxer Get's Smart and Finding a Mate. Simon has also done work for The Australian and The Sydney Morning Herald. 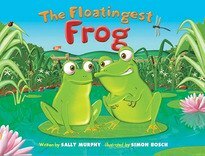 Simon lives in the Blue Mountains and had to take many trips to the local pond to find his inspiration for The Floatingest Frog.